This trick might become your favorite trick. 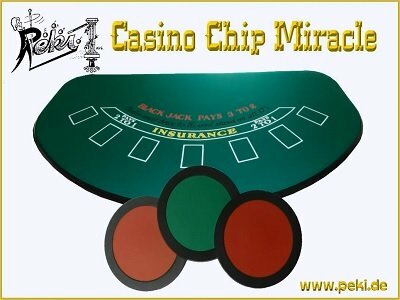 You show spectators a green casino chip. And then every few seconds a new visual effect happens. The chips proliferate and migrate under your hands. They disappear and reappear somewhere else. They change color individually and for the climax all three chips change color. You get a show routine by decorated magician Peki. Peki won with his manipulation performance many international first prizes and also two awards at the FISM World Championships. This chip performance developed over 30 years of practice, has continued to capture the attention of spectators around the world, and captivates audiences with effect after effect. This is visual magic at its best. You will receive a detailed video from the performer's viewpoint. So it's easy to learn the routine in a very short time. Partly filmed in slow motion. Peki teaches this routine without the use of words. Everything is mimed and shown visually. This way there are no language barriers. Anybody can understand the instructions. To order the chips it is best to contact Peki by email email: simsalabim@peki.de. Or order here directly on this German page. 1st edition 2017, 6 min 22 s.